This week 2nd and 3rd year IDEA students tuned in to a panel discussion exploring how the process of creating visual identities is changing. Panelists discussed how we can expect stronger efforts to create more interactive brand experiences in the future. The RGD (The Association of Registered Graphic Designers) webcast was live streamed from the Gladstone Hotel in Toronto. 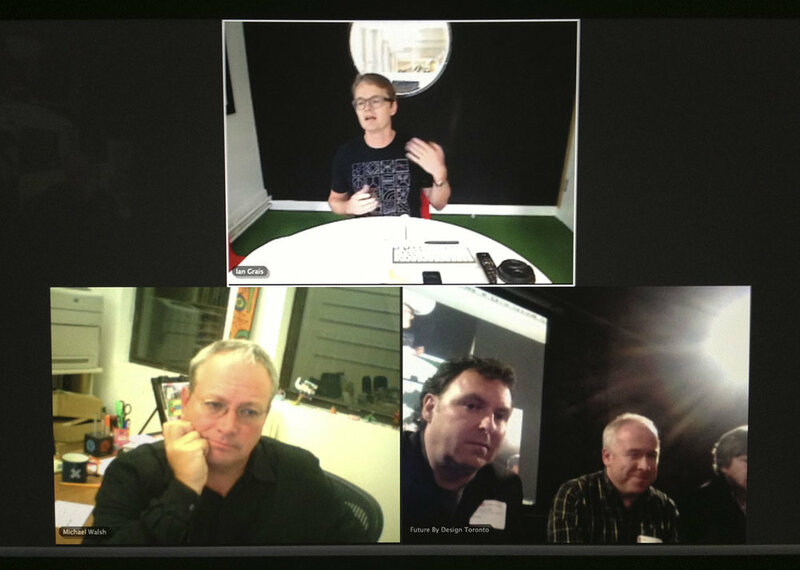 The panel was mediated by John Furneaux RGD, Principal at Projektor, Toronto. On the panel were: Ian Grais, Creative Director at Rethink, Vancouver, discussing Rethink's rebranding work for Shaw Media; John Pylypczak, Co-Founder and Creative Director, Concrete Design Communications Inc., Toronto, discussing Concrete's rebranding of MEC; Barry Quinn RGD, Creative Director, Design at Juniper Park, Toronto, discussing designing for communities, both real and digital, with a case study on the new identity they created for IFEX; and Michael Walsh, Director of Design & Digital Media, SVA, New York, exploring the trend toward logos being designed in-house, with a case study on the recent changes to the School of Visual Arts. John Furneaux highlighted the need for a different approach to identity design in the digital age. Today's logos must be simple enough to be legible at tiny sizes, must be "morphable", allowing them to adapt to different circumstances, media and audiences and able to respond quickly to market changes. Barry Quinn debated whether it is more important today for an identity to be "perfectly crafted or inherantly social". He cautioned today's designers to design organisms, not monuments: seeding ideas for others to build on. The new IFEX logo is designed to allow causes to take ownership of the brand. Ian Grais spoke about evolution not revolution for Rethink's recent Shaw cable rebrand, while John Pylypczak discussed the necessary revolution sparked with some MEC members over the new MEC branding, explaining why the short term pain was unavoidable for long term gain. During question time, the IDEA class asked a question about appropriation of brands: what do we do if an audience appropriates the brand in a negative way, for example using the symbol or concept as part of a negative political message? The panel recognized this is hard to control. Large corporations are continually taking legal action over such issues. If it happens to a less influential company, or an individual, they suggested trying to use the power of social media to right the wrong. Another question was asked about the future of brand standards documents in these times of morphable identities. John Furneaux suggested a logo is nothing without application and Ian Grais added that a designer's time is better spent working through as many applications as possible than wasting time on brand standards that will be quickly outdated. Barry Quinn commented that we have to be less precious about brands than we used to be: we need to create brand guidelines, not brand bibles. Better yet, we need to create brand play books that provide solutions for problems or applications that haven't been thought of yet.